GTA 5 is rated M, meaning it is intended for people aged 17 and above. And yet, on YouTube, some people use GTA 5 to make shows for children, some of which get millions of views per episode. Kids are big business on YouTube, and many of the largest channels on the service cater specifically to them. 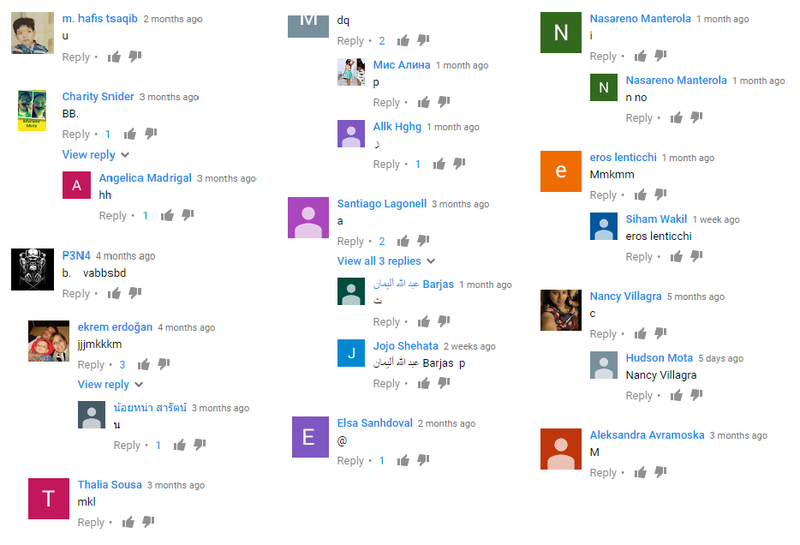 Usually, these videos are educational, and they teach kids how to count or learn the alphabet. GTA 5 is also popular on YouTube, but it's typically for entirely different reasons: the sandbox provides endless spectacle for viewers to enjoy. GTA and shows for children may sound like they shouldn't overlap, but somehow, a sub-genre combining the two on YouTube does exist. And it's enormous. Using GTA 5's director mode, creators can easily make all sorts of videos without having to manually create animations, purchase extra assets, or use real-life sets. Better yet, the cinematic mode allows people to easily control cameras, spawn objects, and pose characters. Coupled with mods, which allow people to insert any character they want into GTA 5, the possibilities are nearly endless. 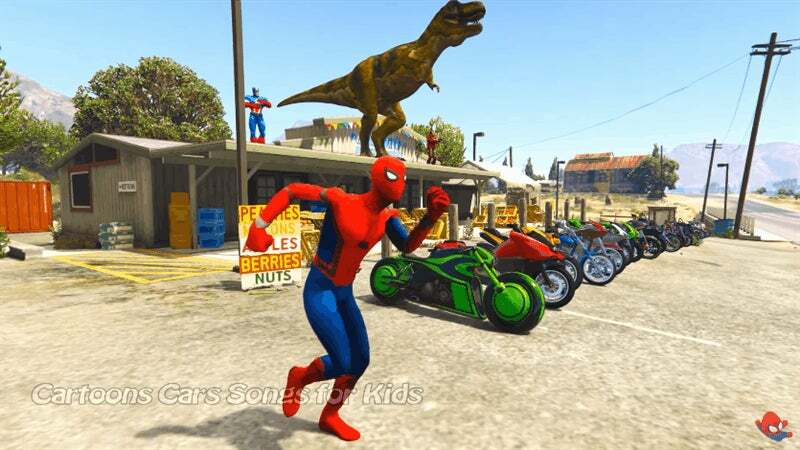 Where Sesame Street has Elmo, GTA 5's kid shows have Spider-Man. Yes, as in the Marvel character. The web slinging superhero appears in almost every prominent GTA 5 kids video that I could find. This GTA version of Spider-Man is pretty versatile, and can be seen doing all sorts of things, from driving a truck to playing a guitar. Backstory-wise, Spider-Man is typically Lightning McQueen's BFF. 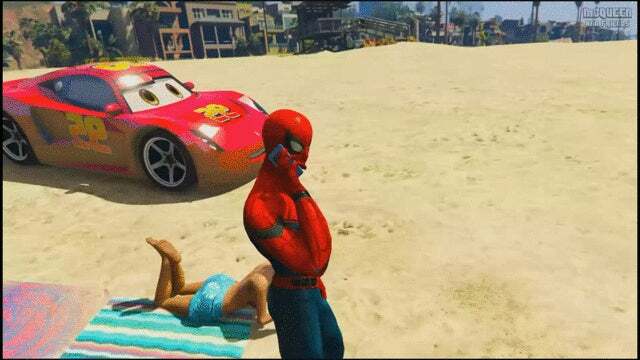 As GTA 5 kid videos tell it, Lightning McQueen isn't as big of a hero as Spider-Man. Most of the time, Lightning McQueen has to be saved by Spider-Man from enemies like the Joker. In a video with 500,000 views, the Joker pours gasoline on McQueen. In a video with 700,000 views, Spider-Man and Lightning McQueen team up and take on dinosaurs. These adventures may sound dramatic, but another core element of GTA 5 kids videos are nursery rhymes. Watch enough of these videos and you will quickly get tired of hearing "Muffin Man" over and over again. I reached out to the creators of these videos and didn't hear back from them, so I can't say why these videos exist. Cynically, they seem like an easy way to make money. At least, it's hard to put some faith into the artistry at work here given that many of these videos appear to copy each other's formula. A good example of this is all of the videos where people or cars are saved from oncoming trains. Usually someone gets stuck on a train track and character like Spider-Man or Lightning McQueen saves them from the speeding train. There. Are. So. Many. Of. These. Videos. Never mind that the same characters appear across multiple YouTube channels. These videos also often feature the same songs, even when they're made by different people. Oh, and not just the same song, but the exact same version of that song. 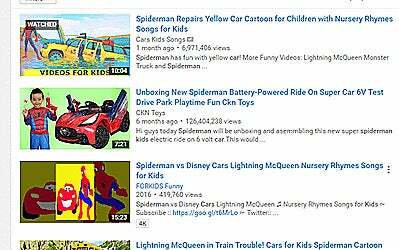 Title-wise, channels tend to use words like fun, kids, superhero, nursery rhyme, children, super, cars, Spider-Man, and so on, though that's presumably more to catch what parents or children might be searching on YouTube. As for why people watch these videos, it seems to come down to brand recognition. You have these well-known characters that everyone loves, except they're in entirely new and unexpected situations. Why settle for watching the same old Pixar and Marvel movies when you can see your favourite character interact with someone new? I may not be a child, but as someone who has played hundreds of hours of GTA 5 and GTA Online, the entertaining appeal of these videos is still obvious to me. Now if you'll excuse me, I have to find a way to get the Muffin Man out of my head. How have these videos not been hit by a DMCA? I find it very difficult to believe this would fall under fair use. I'm instantly reminded of that one Simpsons episode where they let the school be bought by a corporation. It's probably a stretch, but the corporations involved in GTA absolutely market themselves to the younger demographic as much as possible - this wouldn't be something they'd be all that opposed to. Like Fred Flintstone smoking tobacco in the 60s. I'm not that well informed on the particulars, but isn't the network that gave us Sesame Street as far away from what Youtube is allowing here? Looks pretty transformative to me. Discovered these myself a month ago when I saw my 4yr old son watching Spiderman jump around the place. Rate R in this country, Zach.